OlliOlli2 is perfectly suited to the Vita and one of the most fun – yet challenging – titles available on the PSN today. I wasn’t familiar with the original OlliOlli when I first started playing OlliOlli2 (which includes “Welcome to Olliwood” in its full title), so I didn’t know what to expect. Judging from screenshots, I was expecting a mix of Tony Hawk, Line Rider and Trials – and although it’s very different from those titles, there are certain familiar elements to be found. All of them good. My initial fear was that this was going to be a ‘mobile’ game, with simplified controls to accommodate the touch-hungry gaming crowd. This couldn’t be further from the truth – although OlliOlli2 doesn’t require the use of a dozen different buttons, its controls are precise, complex and rewarding when mastered. All of your tricks are done using the left control stick, with a simple flick resulting in the titular olli and an elaborate set of motions resulting in a crazy chain of tricks. It’s the type of stuff we were familiar with in the early Tony Hawk games, only perfectly tailored to the handheld console in terms of controls and visuals. Chaining moves together is the key to high scores and perfect runs, and this can be done by doing ‘manual’ moves in between sections where tricks come easily. Between levels, you’ll find that there’s a big difference in the skill level that’s required as well – since each theme (there are five in total) has easier levels to begin with and opens up a selection of ‘pro’ levels once you beat enough of the standard ones. Keep beating your targets, and you’ll unlock more and more – we still haven’t gotten to the bottom of it so there’s a great deal of content here. 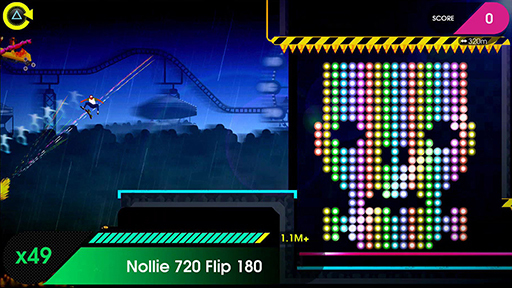 The game’s visual style is colorful and relatively basic, keeping the focus firmly on the skating aspect. The pseudo-platformer style reminds me a little of Line Rider, although the skateboard mechanic is vastly different. Add online leaderboards, a wide array of possible tricks and a budget price tag to the mix – and you’ve got a must-have title for the Vita on your hands here. Highly recommended.